A rib roast is a cut of beef from between the short loin and the chuck of the cow. 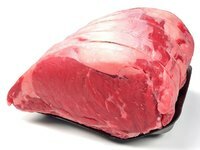 Consider yourself lucky if you are grilling prime rib, because your roast has been graded "Prime" by the USDA. Prime beef has superior fat marbling, which makes it more flavorful. Only about 2 percent of all beef is graded prime, and those roasts are generally sold to restaurants and hardly ever find their way to a public meat market. There are two kinds of prime rib roasts: the standing rib roast still has the rib bones attached, and the rolled rib roast has them removed. If you have a prime rib roast there is no better way to celebrate it than by roasting over a flame. Remove your prime rib roast from the refrigerator and let it stand at room temperature for at least one hour before you cook it. This will help it cook evenly. In the meantime, make sure your propane tank is full. Light all of the burners on your grill and turn them to high heat for 10 minutes. Coat your prime rib roast with canola oil, then sprinkle the roast with kosher salt, about 1/2 tsp. per rib, followed by pepper to taste. Grill your prime rib on high heat to sear it on all sides. Turn the roast to a new side when it no longer sticks to the grate. Turn down the flames on one side of the grill, and put your roast on the other side, where the burners are off, fat side up. Close the lid. Grill your roast until the internal temperature has reached 125 degrees F for a rare roast. This will take at least 90 minutes. Check your roast's temperature with a meat thermometer inserted into the center of the roast. Make sure the thermometer isn't touching any bones. Check every 10 minutes after that and remove the roast when you have reached the correct temperature. If you prefer a medium roast, cook to an internal temperature of 135 F.
Let your roast rest for at least 15 minutes covered with foil before you carve it. This allows the juices to settle back into the meat. The meat's temperature will also continue to rise by about 10 degrees while it rests.